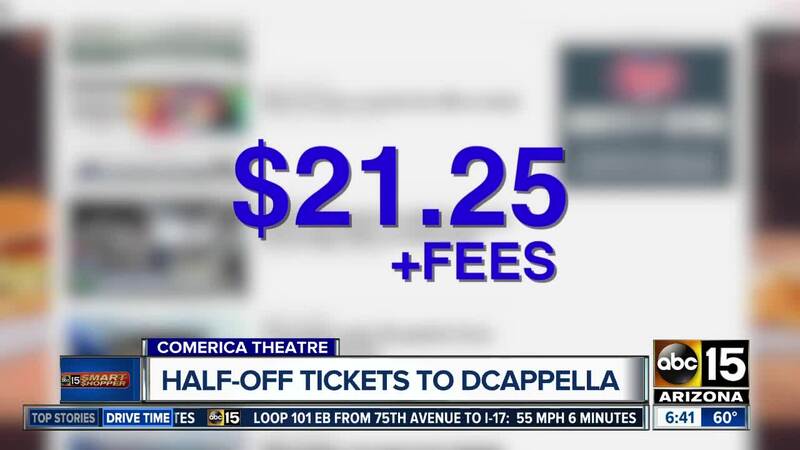 EXCLUSIVE Deal of the Day: score half-off tickets to Disney's DCappella! See Disney's DCappella for half off! It's that time of year when some big shows come to town! We want to make sure you enjoy them, so we are working with Live Nation to score you discounted prices! Instead of A cappella, get ready for DCappella ! We've heard the group sing last year on American Idol's Disney Night, but now, they're coming to the Valley! This cast is amazing. One of the singers starred in all three Pitch Perfect movies. Click here to learn more about each talented member. The show is at Comerica Theatre on March 12, but you'll want to get your tickets now. Tickets range in price from $42.50 to over $130. There are seats left in sections two through six. With our Smart Shopper Deal of the Day, instead of $42.50, you'll pay $21.25 plus fees. That's half off! You have until Friday, March 8 at 8 p.m. to score the discount. Enter the promo code: "ABC15". Click here to see the sections and book your tickets. Our half-off Deal of the Day is only valid for the tickets priced at $42.50, and you must purchase your tickets through Live Nation online. Our discount is not valid in person, by phone or through any other ticketing site. Enjoy the show. We hope it's MAGICAL, just like Disneyland and Disney World.